Subacromial bursitis can arise by itself, or be a marker of other injury within the shoulder joint. It usually manifests as pain during abduction of the shoulder. Abduction is when you bring your arm up to the side, and it especially painful when performing overhead activities. During physical examination there may be what is called a “painful arc” whereby there is minimal pain outside of a particular range of abduction. This is due to impingement (squashing) the bursa against the bone as the shoulder is abducted to the side. 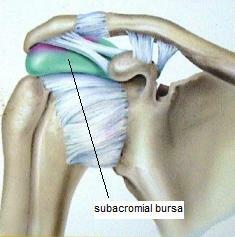 The subacromial bursa can be seen on ultrasound scan or MRI. 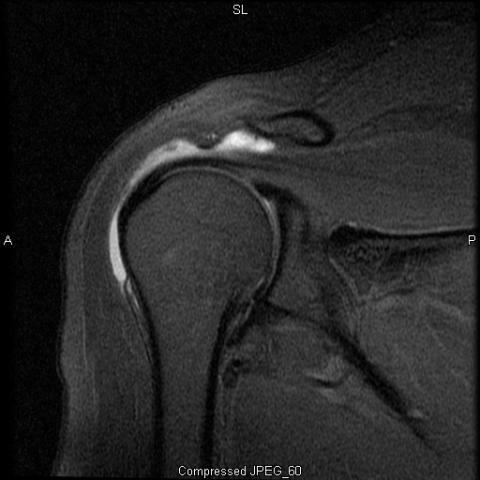 The left image shows a subacromial bursitis on MRI as the high signal intensity (white areas). In the first instance, rest of the shoulder, along with anti-inflammatory medications (if appropriate) can be used, along with various physiotherapy methods, to improve the symptoms. The bursa may settle down over time, and cease to be a problem. If the bursa remains painful or inflamed, then an injection with local anaesthetic with steroid can be used. The steroid acts as a potent local anti-inflammatory, and can stop symptoms forever. In some cases, the bursitis goes away for a short period of time (weeks to several months) and comes back. This is more common when it is associated with other injuries or pathology. The other pathology might be a rotator cuff tear, or severe acromioclavicular joint arthritis. In cases which fail non operative management, it is usually caused by pathology such as a rotator cuff tear, or decreased space in the area called the subacromial space. Some morphologies (shapes) of the acromion predispose to this, and this can be addressed with surgery to reshape the space and remove the bursa. Dr Chien-Wen Liew advocates for a period of non operative management and regular physiotherapy to aid in reduction of symptoms. Some cases may require a shoulder arthroscopy, which is key hole surgery to the shoulder, where the inflamed bursa is removed, along with some of the bone of the acromion.